I just received the most lovely message from a new friend on facebook. He has recently started his raw food journey (exciting!!) and is a fellow bum-wiggler which is also exciting because I truly believe the world needs more happy bum-wiggling! And he likes my red shoes, which made me sad because I’m not sure when I’ll be able to wear them again… damn broken ankle. Anyways, I (by accident) went on a little rant about my ‘guidance’ for a raw foodie newbie, which, in retrospect may have been a little self-indulgent, but thought it might make for a thought-provoking blog post, so here it is. 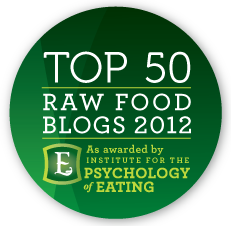 While I am currently embracing more cooked vegan meals to move away from the high-fat gourmet raw, I still love raw foods. It’s inspiring. It’s fun. So enjoy it for what it is. I absolutely agree – with each point. For me – I’m not trying to heal an illness, but through eating high raw and usually high vegan – I feel amazing! I save the gourmet meals for the sometimes category and stick to smoothies, salads, wraps, and just interesting ways of using simple vegetables/fruits as the base of a meal. There’s a lot to be said about that. I think the hardest part is reading all the information objectively and not getting sucked into the ‘fuzzies’ – I’m not sure what to call it but it’s the mindset that everything is evil except raw food. I get why authors try to use those words to an extent – they’re trying to shock people out of there S.A.D. eating ways, but I think it inspires too much guilt and goodness knows there’s enough of that already when it comes to food. There was a point where I got sucked into thinking old fashioned oatmeal was evil and that’s just ridiculous, I spent a week eating baked oatmeal in the Fall and felt just as light and wonderful as if I had my green smoothies. Thanks for the response Michelle! I love the idea of “intuitive eating”, and suppose like most things, the more you experiment and learn, the better you become at it, without having to ‘buy-in’ to an all-or-nothing philosophy. I found that particularly hard at the start, like I was going to ruin my body if I ate cooked food ever again – which is nonsense, particularly as you say, I wasn’t overcoming any significant health issues. I now think having tasty, fun ways to bring more fresh food into your world is always a plus – and understanding the key things to cut out gets you a long way towards better health. Thanks. I’m struggling with getting into raw foods because I see people making such tremendous gains from it (particularly with their skin!) and think it would really spike my energy levels to eat mostly raw, and stop eating wheat, cut down on sugar, and not eat much dairy as well. I’m scared, though, partly because at the moment I am an omnivore (weirdly enough because I think if I went vegetarian I would have a dependency on cheese which I don’t now) and the times I tried to go all raw vegan cold turkey (without beans), it didn’t take. I’ve been focusing on upping my consumption of raw, usually organic foods, (and cooked) but I still feel bad when I cheat with something, like sauteeing my beet greens for too long or eating slivers of meat. You think I should focus on going down the vegetarian/vegan scale right now and then raw? This is probably going to be wrong, but, will I still be able to see some benefits if I spike my consumption of raw fruits/vegetables/juice and continue to supplement with cooked vegetables/lentils….. or even do eat meat, but very minimally? I used to be way more into the philosophy of focusing on including good things, but eating everything in moderation, but I see people make such tremendous gains when they cut something completely out. I’m really not sure there is a ‘right’ or ‘wrong’ way to approach the change… some people can only do an all-or-nothing approach – clean out all the temptations from the kitchen and go do a huge, healthy shop to get staple foods (and maybe start with a juice cleanse or similar). Other’s are ok with gradually increasing raw foods. My only advice – don’t get hooked on cheese!! I like the cleanse approach as you can structure what you eat for a period of time and it gives you the space to detox – you know it’s going to happen and that’s it’s going to be a bit tricky, but you get it all out of the way. Once you have done a cleanse you won’t feel like the foods you’re probably now hooked on (meats, dairy etc) because they’ll feel heavy and ‘unclean’. I have Kimberly Synder’s Beauty Detox book in the mail so want to do that soon if you want to join me :) Otherwise you could check out juice fasts/feasts – try Joe the Juicer. I also loved Conscious Lifestylers colon cleanse and 30 day challenge but it’s not always affordable. Let me know if you have any questions / need any support / or how you go! !